I am a blog ambassador for Lakeshore and am compensated for my work. I received product free of charge, but all thoughts and opinions are 100% mine. 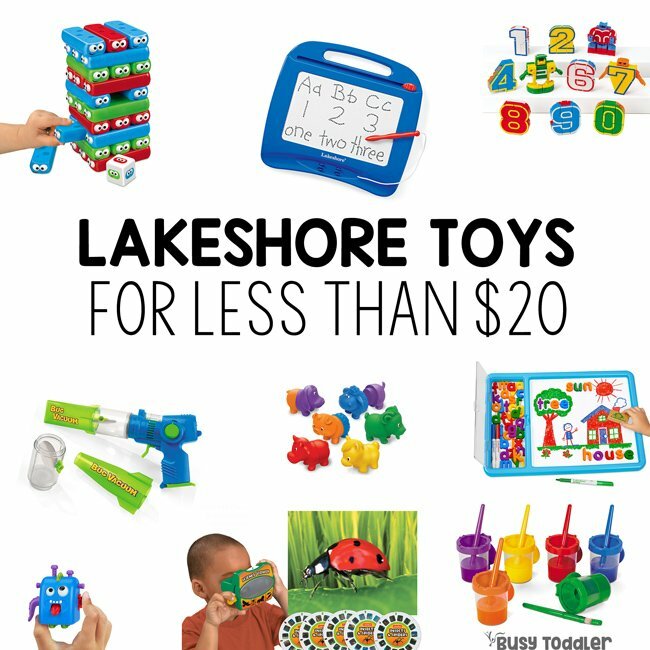 INSIDE: Best Lakeshore toys under $20. Great toys don’t have to break the bank! Somehow a rumor was started that toys need to be fancy. They need to be flashy, they need to be big, and they need to be expensive. This is so far from the truth and we all know it is (case and point: that cardboard box your kiddo loves to play with). When we’re looking for toys for our kids, bigger isn’t always better. Fancier isn’t going to make them play with it more. The price tag is not going to change your child’s opinion of that toy. RELATED: Want to see more Lakeshore toys? Check out all my favorites. We need to be vigilant with the toys we buy. Toy are important. Toys are a big deal and it’s our job as the “gatekeepers” of toys to pick the right ones for kids. 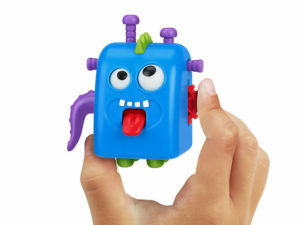 We want toys that grow with our kids. We want toys that will inspire hours, days, years of play. Where do you find great toys? I find great toys at Lakeshore Learning. This is my go-to store for the best of the best toys for kids: toys that will last for years, will engage my kids, and will enhance their play. Every year, Lakeshore releases their Gifts for Growing Minds catalogue and my kids can’t put it down. 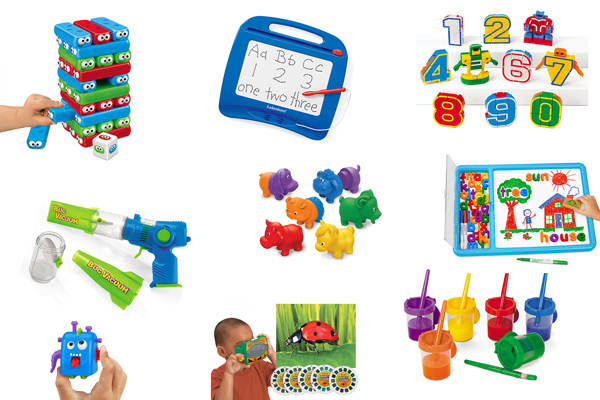 It’s always packed with quality, open-ended toys that my children love. RELATED: Looking for non-toy gifts? See my three favorite non-toy gifts. Remember – great toys don’t need to break the bank. Quality toys are out there. Quality toys don’t have to cost loads of money. 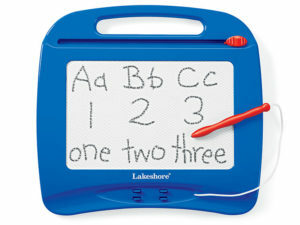 Some of my favorite Lakeshore toys under $20 are the best. Great toys are out there at every price point. Here are some of my favorites (in no particular order) with prices less than $20/each. 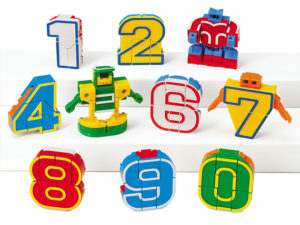 Hands down, these numbers (that transform into robots) are some of the most played with toys at my house. There’s something magical about them! This is absolutely the COOLEST. It project space images onto the ceiling or wall and has inspired hours of outer space play for my kids. 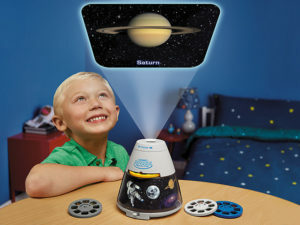 They turn this on and suddenly they’re astronauts! We love this little guy! My oldest (5.5 years old) holds him in the car on long trips – keeps his hands busy – and also at night time as he’s falling asleep. It’s been just the right amount of sensory for him. 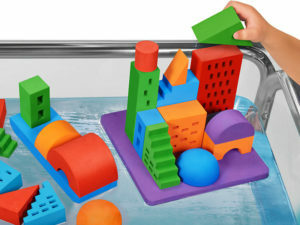 *On sale for $19.99* In the bath tub, in the water table, in the sensory bin – these water blocks are AMAZING. They float and they inspire. They’re pretty incredible. 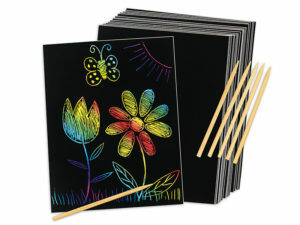 An art project in and of itself – kids LOVE using this paper. 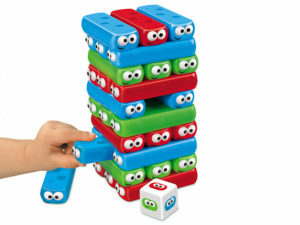 We love this game – it’s like Jenga for kids. The pieces move smoother than traditional wooden pieces AND the big faces mean they double as a great toy / imaginative play opportunity. I’m such a fan of these boards – so much so that we have two. They’re just the right size and even perfect for road trips. 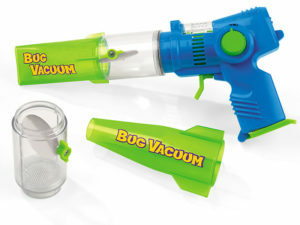 Always a hit – such a fun twist on catching bugs in the backyard. 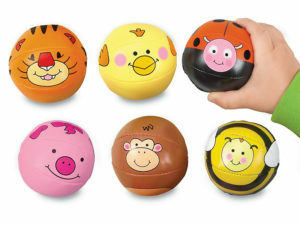 I gave these to my youngest for his first birthday, and here we are – almost a year and a half later – and the love for these balls has only gotten stronger. They are the best little balls and I give them out as birthday gifts. 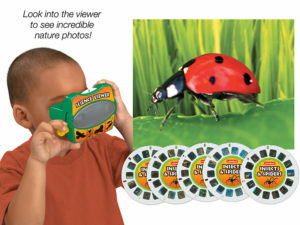 We love our A View from Around the World – Set 1, and I can’t wait to get this insect version for my daughter. 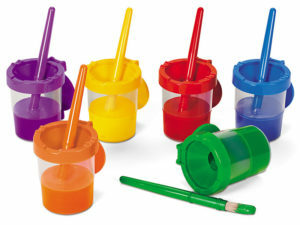 What would painting life be like without these? My favorite part is the matching paint brushes…even the youngest of kiddos can keep the paint and brushes from mixing colors. HALLELUJAH! 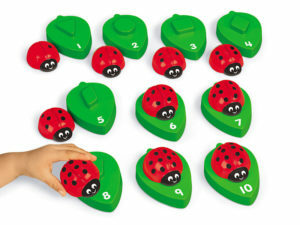 I can’t imagine my daughter’s play life without her beloved ladybugs. They teach both numbers and shapes, but inspire so much more. She hides them, uses them in her doll house, and makes lots of play with them. They are way beyond what they might seem. 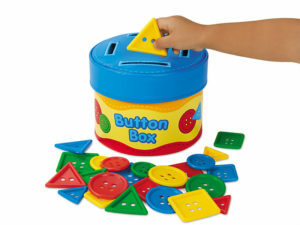 Such a complete toy – it comes with the markers and the alphabet magnets, and everything stores in the toy for later use. 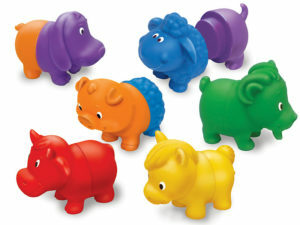 What sets these apart from other farm animals toys is their color, size, and mix & match capabilities. My kids use these the most in farm play activities, and are always mixing up the fronts and backs. My son has long-eyed this at Lakeshore and he’s finally getting it! 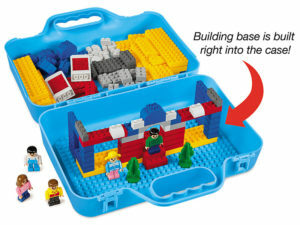 It’s a compact case that holds building bricks, but the base plate is already part of the case. It’s perfect for travel. 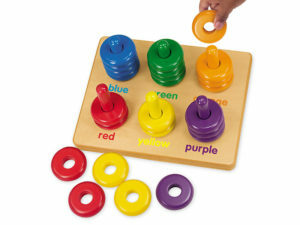 This puzzle is actually part of the Classic Hardwood Learning Toys – Complete Set. I love each of these puzzles/toys so much. They have been huge hits for three years in our house. 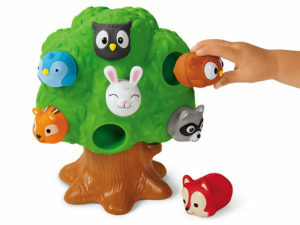 Think of how brilliant this toy is – a tree and 8 animals for under $20. It’s one of the most inviting toys in my house. What a wonderful toy! My son got this when he was 11 months old. He’s now 26 months old and still loves this every bit as much as back then. He sorts with it almost every day. 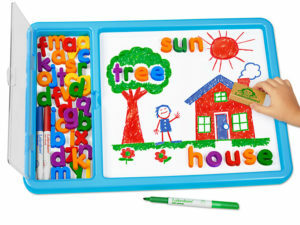 Great toys don’t have to cost great amounts of money! It’s important to know the right place to look for quality toys. Lakeshore Learning has been my go-to for almost a decade now. I know the products are teacher-designed, kid tested, and absolutely wonderful to play and learn with. Looking to grab some gifts for your kids? 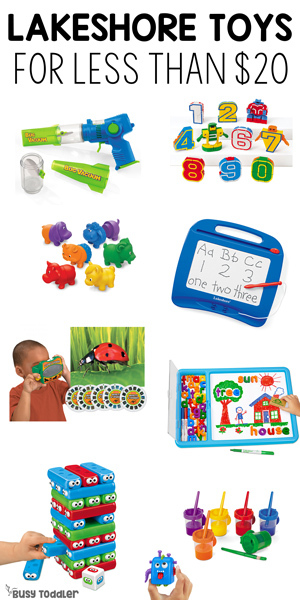 Use this 25% Off coupon code from Lakeshore Learning! To learn more about Lakeshore, find them on Facebook, Instagram, Twitter, Pinterest and YouTube.